Which songs stick in your mind? THE CLASH, a British punk band, declared in 1979 that “phoney Beatlemania has bitten the dust”. Four decades later, a team of psychologists at New York University has found that the Fab Four are alive and well in the minds of millennials. The psychologists wanted to investigate how young people’s “collective memory” of music changes with the age of the songs themselves. 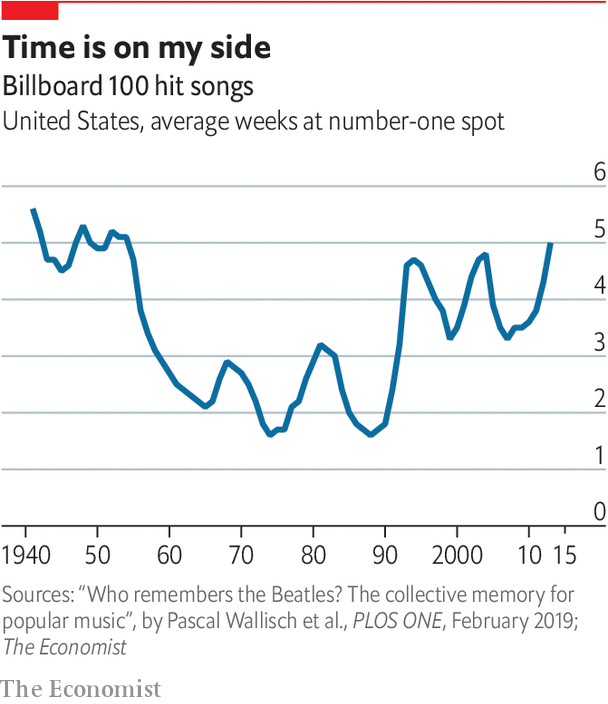 For each year between 1940 and 2015, the researchers randomly selected two of the year’s number-one hits on America’s Billboard 100 chart. Then they asked 630 people (most of whom were students) to listen to short clips of those songs and to point out which tunes they recognised. As they had expected, the researchers found that a song’s chances of being recognised declined with its age. But that decline was far from uniform. For hits released in the 21st century, it was very steep: the listeners were nearly twice as likely to remember a chart-topper from 2015 as one from 2000. 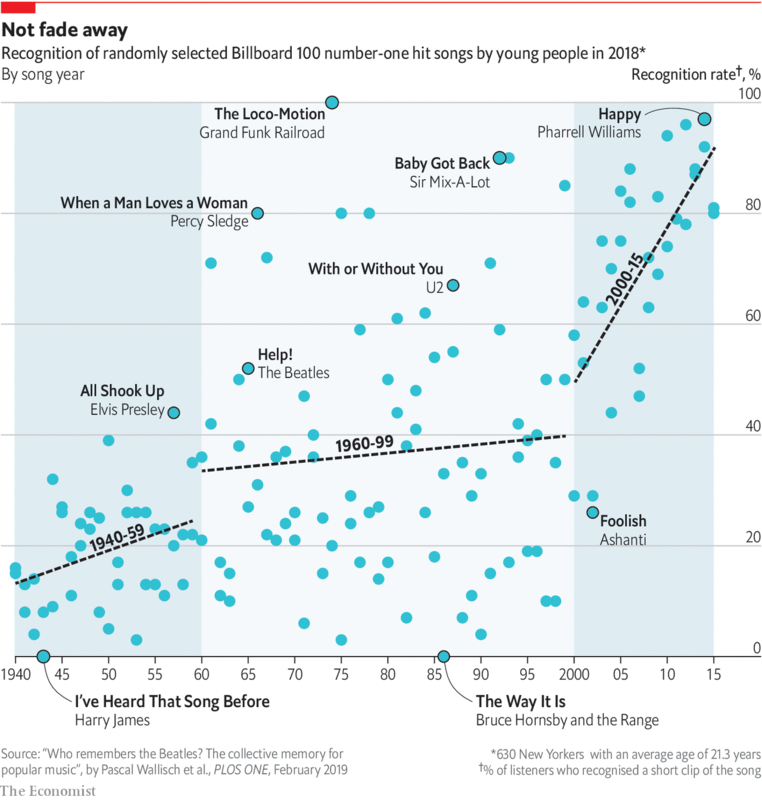 Between 1960 and 1999, however, the rate of song recognition reached a plateau. The millennial participants were nearly as familiar with the hits of the Beatles as they were with singles by the Notorious B.I.G. and Mariah Carey. Their collective memory seemed to fall away again between 1940 and 1959. The professors offer a few possible explanations for these patterns. One is that today’s college students have picked up the musical tastes of their parents, who might have blared golden oldies on the car stereo. Another is that music from the Swinging Sixties onwards was more stirring. Rock and pop stars experimented with more sounds and bolder lyrics. Perhaps a higher churn in hit singles—the average number-one tune between 1960 and 1990 lasted barely a fortnight—indicates a greater number of super-hits competing for top spot. Whatever the cause, the authors conclude that “the period from the 1960s to the 1990s was a special time in popular music history”. Which of the study’s songs stood out most? Perhaps surprisingly, all of the participants were familiar with “The Loco-Motion”, a cover of a 1960s song performed by Grand Funk Railroad in 1974. (Neither Little Eva’s original recording nor Kylie Minogue’s cover in 1988 were in the sample, though listeners might have recognised the tune from those versions.) Pharrell Williams’s joyful ditty “Happy” from 2013 was recognised by 97% of the listeners. But sadly, one former hit got no recognition at all: Harry James’s 1942 recording of “I’ve Heard That Song Before”.